The last three weeks have been full and busy. Hurricane Matthew brought many unexpected and sudden changes to our lives around here, but we are gradually adjusting back into routine. The days surrounding the hurricane were busy and exhausting. The couple of days before were spent preparing (boarding up windows, removing solar panels, etc), and the week or more after were full of repair and cleanup. The hurricane itself was unlike anything we’ve ever experienced, shaking even our solid concrete homes a time or two. The winds and rain were unreal and lasted unceasingly for hours. When we finally were able to look outside, the damage was devastating. Trees were stripped and had fallen everywhere, and so many, many homes had lost their roofs or more, including a few missionary homes. Areas further west, in the direct path of the hurricane, were destroyed completely. Please pray for the Haitian people as they seek shelter and food in this time of desperation. Most of the roads had places like this that were completely impassable. Branches broken everywhere. Notice the huge amount of water standing in the background. Trees down all over the place, homes damaged. Lots of homes now look like this – roofs destroyed and even walls broken. Our focus during the first few days after the hurricane was to repair our own homes to put us in a place capable of helping others. We spent days just clearing roads of fallen trees so we could move around. Our electric (besides solar) and water systems had both been broken and took more days of repair work. Within two weeks of the hurricane, we were in a stable position to begin repairing roofs, starting with some of the missionary homes that needed it most immediately. We were thankful to see our depot standing strong on the side of the hill after the storm. After being engineered and constructed almost four years ago, this was the first real test of its strength, and it stood. We have been so thankful to have it, also, as a large central storage area, both for ourselves and other ministries who have used it in their own distribution efforts. As we move forward into this team season, our focus will continue to be on church and school roofs, though it will consist more of repair and reconstruction than building new for a while. We will still host our regularly scheduled teams and are thankful for their flexibility and willingness to be used however is best during this time. We are also receiving a couple additional teams in these next couple weeks to help with additional building needs now. Thank you for your continued prayers as we move ahead. Please pray for strength, wisdom and discernment in making decisions for how to best help, safety, and most of all God’s glory and purpose through it all. Our last team of the season (already over a month ago!) came from central IL. We had quite the adventurous time with them. We headed out to the west tip of the island, along the southern coast, to Sable, where we put the first roof on. It was a small church/school combination in a country community. This congregation had been meeting under coconut leaves for a while, and they were so excited to finally be getting a roof for their church. The pastor commented that even though the physical building is not so important and God sees our hearts as we worship, it was still so special to have a nicer place to gather. The benches at the top are what the church had before. The lower are what they have now. From Sable, we traveled back along the coast a bit and then traveled inland a bit, up the mountains to Dalmette. The road up the mountain was steep and rocky and not fit for vehicles. Thus, we drove as far as we possibly could and then hiked 30-45 minutes up to the village. Scott had brought the building materials (lumber, tin, etc) a few weeks before, so the local people had already carried all of that up for us, piece by piece. We had all of our luggage, tools, and water to haul up, though, and we were glad for the motorcycles and donkeys and people that made many trips for us, helping out. The view was amazing! The building was another church/school combination, sitting right on top of the mountain. We built 10 church benches and 10 school desks at both Sable and Dalmette. These faces…they’re why we do this. Many of the ladies that cooked for us while we were with them. We are thankful for each person that comes down on our teams. This team season was a blessing to us and to the communities that we visited. We are also always extremely grateful for the safety and protection that God grants us in not-so-ideal situations and for the blessings that He brings along the way. We know it is His work, and He provides in His sovereignty and by His grace. A big THANK YOU from the guesthouse to all of you who helped in buying new tables and chairs for the dining room. They arrived down here on a sea container and are working great. Thanks for your part in providing for the guesthouse! A few weeks ago, we hosted the Pinetta team from north Florida and south Georgia. This team got a lot done and hopped right along from job to job. We started out the week by heading along the southern coast of Haiti, past Cotes de Fer, and into the mountains, to a little town called Gris Gris. The team worked hard, and we got the trusses set and benches built by Saturday night. I really appreciated this little church. The body of believers wasn’t very big, but they were full of heart and worship. There is something about a little country church that stirs my heart. Their joy and praise were contagious. I also enjoyed watching the team interact with the people of the community. They were here for more than just to build a roof. They wanted to touch lives and be touched, as well. The team was quick in varnishing the benches and nailing tin Monday morning, and we were on the road in good time. Since they had yet another day, the team headed out to the Torbeck area to start work on yet another roof. They weren’t able to finish it, but our Haitian workers went back the next day to complete it. I am thankful yet again for how God protects and provides for His work and His people. A few weeks ago, we had a team from the Yordys’ home church of Roanoke. It is always a special blessing for each of us here to see people from home, as the Yordys experienced once again that week. On Saturday, we made the short trip (10 minutes, maybe) to Bergeaud to continue what the Silverton team had started. The trusses were built already, so the Roanoke team went about setting them in place. This church is two stories high, though, which always makes for a little more caution and a few more prayers for safety. We are thankful for God’s protection. There wasn’t time for the tin that day, so our Haitian workers came back another day to finish the roof. Sunday, since we weren’t staying out in a community somewhere, the team got the opportunity to visit Renault. Renault is one of the poorest slums of Les Cayes, where another missionary family has a weekly Sunday school for over 1200 local children. It’s a wonderful opportunity to love the least and watch as they sing their hearts out and learn about Jesus. The children also then each get to take a rice pack home to help feed their families. On Monday, we headed out to our second job for the week at Gourdet. This place was about a three hour drive away. We worked all afternoon, got the trusses set, and finished painting the benches just as it was getting too dark to see what we were doing. Tuesday morning, the men made quick work of the tin before we headed back home. This was a really neat community. It was encouraging to see the faith of the local people. The little lady in the pink jacket (front and center of the bottom picture) especially shared her testimony of God’s goodness. She has done a lot of work in that community, leaning on God’s faithfulness the whole time. She started a school and has taught many, many children, and she has been praying for years for the church building. Just as we got to Gourdet and started working, it started sprinkling. She stood off to the side singing prayers for us, and the skies cleared up, and we didn’t get another drop. It is refreshing and challenging to see the depth of faith in God’s people here. The simplest of toys are the best. This little boy started building using the scraps of wood from the trusses. 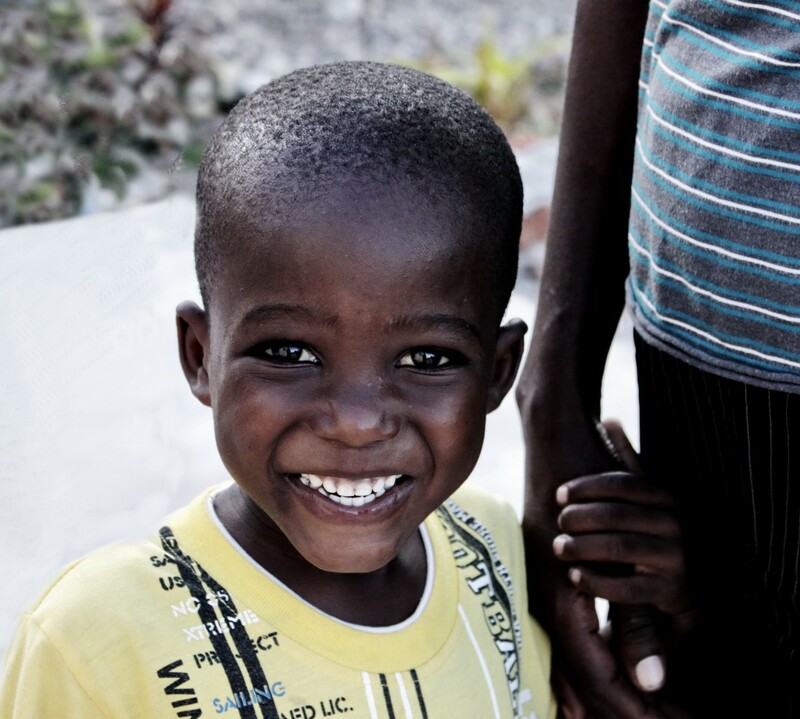 Thank you for your continued prayers for all of us as we watch God move and work in and through His people here in Haiti. We praise Him for His faithfulness! About a month ago, we were happy to host the Silverton team. Only about half of the team was actually from Oregon, though, and the rest were from Indiana and Ohio. This team got the opportunity to head off the mainland to an island for the weekend. We had about a six-hour drive to Pestel (where we took the Bluffton team), on the north coast of southern Haiti, and then an hour boat ride across the bay to a village on Grande Cayemite, where we roofed a school and built 10 school desks. The team learned a lot about flexibility during the week. There were many opportunities to go with the flow and take life as it comes. To begin with, after a day+ of traveling and short night for the team, we left at 6am on Saturday morning, with the intention of getting out to the island early enough to get a bit of work done Saturday afternoon. Turns out, we spent three hours in Pestel waiting for our boat to show up. Then, instead of the boat that Scott requested, a smaller one showed up, and we really wondered whether we were going to fit everything in. We filled the boat with tools and luggage and water jugs and more and then topped it off with 29 people (the 24 of our team, plus the five transporting us). As Scott commented, it’s a good thing we serve a big God. We added 24 people to the top of this load for our ride out to the island. Since the village is on an island, the people don’t see a lot of white people, and they (especially the kids) took full advantage of their time with us. They crowded around as much and as often as they could. See a crowd? There’s probably a white person in the middle somewhere. The Haitians also love to gather around as we work to either watch or help. The men had many, many little hands eager to help pound nails on the trusses. In this particular area of the island, the ground was very, very rocky. There were no flat places anywhere near the church on which to build, so we built everything inside the church (trusses and school desks) and creatively balanced our desks wherever we could to paint them. These are just a few of the local ladies that cooked for us while we were there. The team continued their exercise in flexibility when they spent a day working on trusses at Bergeaud (near Les Cayes) and the truss design for that church had to be revised on the spot. And finally, with one delay after another, some of the Silverton crew spent almost 72 hours just trying to get home again! The entire team at Port Salut. We’re always thankful, though, for a safe week full of God’s blessings! We hit the ground running with this New Year, since our first team came in on January 1st, and things are switched up a bit here, too. Brent and Alisha headed to the States right before Christmas for a couple months as they await the birth of their first child at the end of January, so we are blessed to have had Ed and Julie Sanders join us here in Haiti again to help fill in the gaps. Alisha usually takes care of this blog, but in her absence Bri and Leah will be filling in. We enjoyed having the Ohio team back once again. One of the highlights of the week (for both the visiting and hosting teams), was the devotions we had nightly. Everyone was asked to share on the verses we read, and because of that, the devotions made us reflect and apply it to our lives. During their week here, the team built roofs for churches in both Dory and Rhe. We love watching the teams work together. Everyone has a place to fill. No matter what their talents were, the team members helped out where they could. or making and painting benches. Because everyone did what they could, everything went smoothly, and we got the roof done without accident. It is amazing how God knows who to put on a team, and if someone doesn’t know how to do something, someone else steps up and helps out. It’s also cool to see watch the team, even though everyone has different talents, work together like clockwork. Praise be to God who is the only one who could make that possible. We also had fun. Whether we were working or eating or sitting and talking, we were having fun. Because the team got done early with the jobs we had lined up for them, they were able to help Scott do a few things around the Construction Department, which included (but was not limited to) hanging gutters for the Yordys and Walders and installing fans at the guesthouse. We so appreciate each person that comes down on our teams and the willingness they have to step out of their comfort zones and to give of themselves for others.